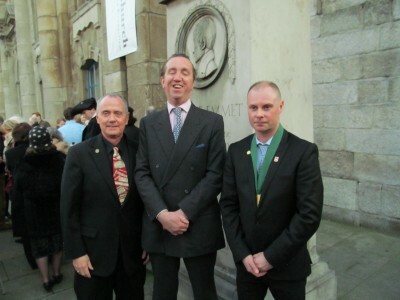 J. David Markam, Philip Emmet and Derek Byrne President of Finte O’Broin, at the launch of the Napoleon Society of Ireland. St. Catherine’s Church, Thomas Street, Dublin, Sunday March 4th 2012. 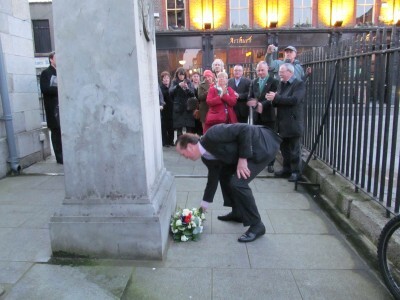 Philip Emmet laying the wreath at the Emmet Memorial. The Society was officially launched jointly by Gerard Cairet, Head of Consulate at the French Embassy and Mr. Chris Flynn, Principal Officer, Department of Arts, Heritage and Gaeltacht Affairs. The Emmet Medal for Humanitarianism in an Irish context was presented to Sister Stan Kennedy, founder of the Irish Immigrant Council of Ireland, by Philip Emmet at the event. Derek Byrne President of Finte O’Broin, was made a Fellow of the International Napoleonic Society by Prince Charles Napoleon and he was presented with a medal of honour by J. David Markham at the event for his work in highlighting the humanitarian aspect to Napoleon and for establishing The Napoleon Society of Ireland.